The third and final chapter in the award winning Viking RPG trilogy, Banner Saga 3 will launch on July 24th, 2018 for PC, Mac, PlayStation 4, Xbox One and Nintendo Switch. Mobile platforms are expected to launch later on in the year. There will be three digital versions of the game at launch. 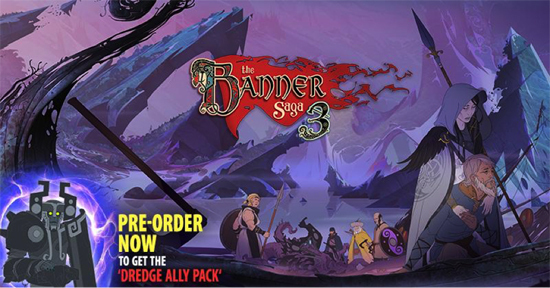 The Standard Edition of Banner Saga 3 on PC will cost $24.99, while the Deluxe Edition will be priced at $29.99 and will include the game’s official soundtrack composed by Austin Wintory in addition to a digital wallpaper, world map and the ‘Gold Wasp’ in-game title. The Banner Saga 3 Legendary Edition is priced at $39.99 and includes everything that comes in the Deluxe Edition as well as the exclusive ‘Shadow Walker’ Heroic Title, the ‘Petrie Clan Ring’ exclusive legendary item and digital novel ‘Gift of Hadrborg’. The Banner Saga Trilogy: Bonus Edition - for both Xbox One and PlayStation 4 priced at $39.99. The Bonus Edition will enable RPG fans to dive headlong into the entire Viking adventure and will include Banner Sagas 1, 2 and 3 plus a mini art book, poster, best of soundtrack and in-game digital item. It will be available at major game retailers on July 24th in the US and July 27th in Europe. A digital PC Bonus Edition featuring all three games will also be available. In Banner Saga 3, players will embark upon the final journey beyond the wall of Darkness to traverse a world unlike anything encountered in previous sagas. The games compelling story driven narrative will continue to encourage the character building and strategic aspects which were essential to the previous games popularity with fans. Story secrets will be brought to light and character motives will be made clear. The end has come.